The government has declared a national state of emergency. Police have confirmed 75 fatalities at this point, 55 of whom have been identified. Rescue workers are still searching for survivors in the central business district, while many have been pulled out alive from the wreckage. Tuesday’s shallow 6.3 magnitude quake hit at 12:51 pm local time, breaking the spire of the city’s signature stone cathedral, knocking out power and telephone services and bursting underground pipes, flooding the streets with muddy sludge. 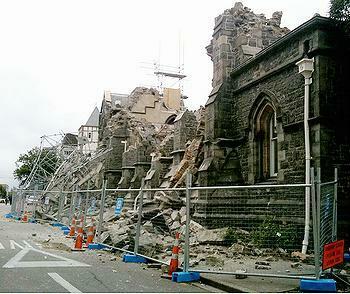 The surrounding Canterbury region also sustained damage from the temblor, the second major quake there in five months. Since then, there have been 37 aftershocks greater than magnitude four, with many greater than magnitude five. Civil defence officials warn that aftershocks are likely to continue and this could lead to further building damage or collapse. 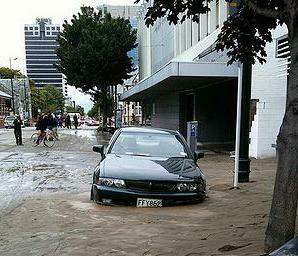 Police are urging people to stay out of the Christchurch central city business area and warn that rescue work is likely to take days to complete. 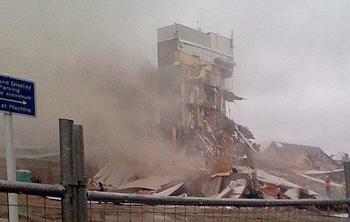 Christchurch Hospital is operational. An emergency operations center has been set up at Princess Margaret Hospital. Emergency triage centres for the injured are operating at Latimer Square, Canterbury University and the Sanitarium Building in Papanui. Other South Island hospitals have cleared capacity in anticipation of casualties from Christchurch, said English. In addition, Defence Force personnel are providing medical assistance around the city. Medical staff are being brought in from around New Zealand to assist. Christchurch International Airport was initally closed but now is open for emergency flights only. The Air Force is providing transport for the emergency response, one Hercules and one Boeing are in Christchurch and a further Hercules and a Boeing are available. The harbor is closed for at least 24 hours as some wharves have sustained serious damage. New Zealand’s second-largest city was still rebuilding from a more powerful 7.1 magnitude earthquake that struck on September 4, 2010, but caused no deaths. The U.S. Geological Survey said Tuesday’s quake was an aftershock from September’s temblor. 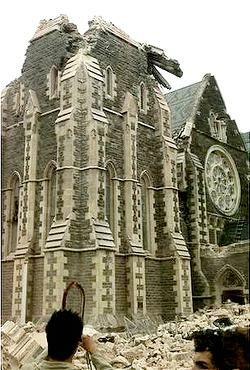 A strong aftershock in December caused further damage to buildings. The New Zealand geological service GeoNet said the shaking intensity in Christchurch was much greater for this earthquake than that of last September because the epicentre was just 10 kilometers from the city and also due to the shallow depth of the quake, just seven kilometers beneath the surface. To date, the government has accepted offers of assistance from Australia, the United States, Singapore, the United Kingdom, Japan and Taiwan. A United States New Zealand Partnership Forum meeting in Christchurch February 20-22 had brought 120 leaders from both countries to the city. None of the forum delegates was injured in the quake. Prime Minister Key addressed the Forum, which included former Prime Minister James Bolger and former Deputy Prime Minister Dr. Michael Cullen. Former U.S. Senator and Governor of Indiana Evan Bayh and former U.S. Trade Representative Ambassador Susan Schwab led the U.S. delegation to the Partnership Forum. The largest group of Congressional representatives ever to visit New Zealand was part of the U.S. delegation. Led by Chairman Donald Manzullo of the Subcommittee on Asia-Pacific, House Foreign Affairs Committee, an Illinois Republican, the congressional group includes Representatives Dan Lungren (R), Kevin Brady (R), Gregory Meeks (D), Joe Crowley (D) and Rick Larsen (D), as well as Eni Faleomavaega (D) of American Samoa and Gregorio Sablan (D) of Commonwealth of the Northern Mariana Islands.